Thirty miles west of downtown Austin the Pedernales River cuts through the hill country, dropping 50 feet over a distance of 3,000 feet, forming a series of cascades across a tilted layer of 300-million-year-old Marble Falls Limestone. The low waterfalls and numerous fluvial slots and potholes attract throngs of people to stroll across the rocks and enjoy the fascinating scenery. 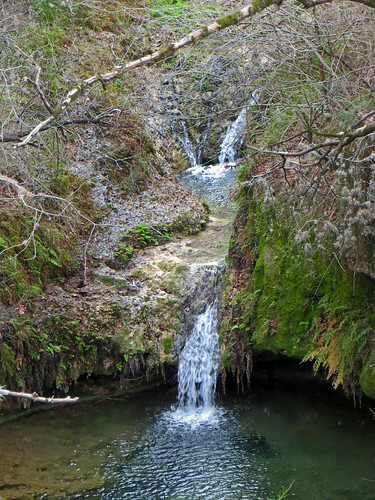 The falls were part of the Circle Bar Ranch, which was acquired by the state of Texas in 1970 and developed and expanded into a state park. Wendy and I were charged $6 each to enter the park. We headed straight to the falls area, where we parked and walked down the trail to the overlook. Dozens of folks were milling about the riverbed, which went dry back in 2009 and 2011. The drought has lifted a bit, and the spring-fed river had some flow for our visit; it has been known to flash into a raging torrent. We took the east fork of the trail leading down from the overlook to the eastern edge of the falls, where the river cuts through narrow slots in a broad plane of marble limestone. We followed a trail of rock dust deposited on the limestone by hikers’ footwear to the lumpy limestone riverbed. 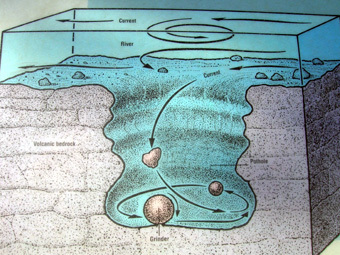 There were potholes both large and small, formed when rock clasts get caught up in whirlpools and cut through the limestone. The river cascading down from higher falls roared through deep slots in the rock, wriggling its way eastward. A large boulder wedged in one slot testified to the power of the flash floods. Wendy captured a shot of me relaxing by a slot, with my customary trail drink, an Orange Fanta. She was fascinated by the unusual textures of the rock surfaces throughout the falls area, which had potholes, grooves, craters, breccia, karst, gashes, and dimples. We climbed to one of the large pools, where I reclined for a low shot across the water. Wendy posed for me beside a low fall, and we climbed back up to the overlook to take the more difficult west trail fork across rough terrain to the higher falls. The hillside across the river here had scenic erosion with mottled rocks, a cliffside hole partially plugged by a boulder, and water-filled clefts. Upstream we posed for a shot, Wendy found a rock bathtub, and there were more waterfalls with longer drops. The gouged limestone and pools created a very different landscape, as did the yucca plants by the riverside and the white lichen. After we spent a couple of hours exploring the falls area, I consulted the park map. Wendy laughed at my typical pose with my spectacles dangling from my mouth, since I cannot read anymore with them on. I discovered a few weeks ago why I’ve struggled for years with these lenses, despite them being purchased as my first set of progressive bifocals. They are NOT bifocals; the optical house screwed up! I feel pretty stupid for not realizing this much sooner, and hopefully new lenses will help me with this annoyance. I chose to drive us over to the Twin Falls Nature Trail to hike that short but steep loop. We ducked under a large tree and wound our way down the hillside, encountering two young ladies who were hurriedly attaching balloons to bushes along the path. They excused themselves, explaining that they were preparing the trail for their sister’s engagement down at the overlook. We found their decorations all the way to the overlook, where we spied flowers awaiting the happy couple, and carefully arranged stones down below the pretty little waterfalls. We then climbed back to the road, encountering the happy couple just starting their way down the trail. The groom-to-be asked if this was the Twin Falls Trail. I replied that it was and we hoped they enjoyed it. He gave me a knowing grin as they departed; I am certain they enjoyed their walk! 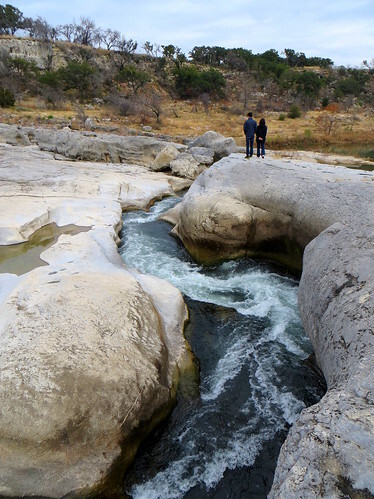 We wrapped up our time at the park with a walk down to Trammell’s Crossing, a rocky ford on the Pedernales. 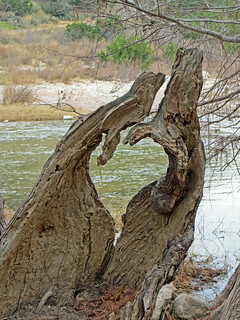 Down at the riverbank we found some photogenic trees, including a stump which formed a nice heart frame for my sweetie. We wrapped up the day with dinner at the Salt Lick in Austin, provided by long-time friends Joe and Bama Falkner, who have retired there. Joe was on the Bartlesville school board back when I was looking for my first teaching job. When the physics job opened up at the high school a few weeks before school started, Joe mentioned to the high school principal that his younger brother’s friend from high school and college just happened to be looking for such a position. A quarter century on, I’m still grateful how that tip led to an interview which launched my happy teaching career in Bartlesville. After dinner and fellowship with Joe and Bama, Wendy and I headed to San Antonio for what turned out to be a four-day stay.